Curation is always difficult. It involves hours of work and focus with the added combination of a keen eye and a strong will. More often than not, it means accepting that in the eyes of some you’ll be a hero and a genius, while for others, you might be a snob or a fool. What happens then, when we take the role of art curator and reimagine it into a more communal act? What would happen if we gave away some of that control and let the artists speak for themselves? Michael Christensen, Visual and Performing Arts Manager for the Utah Cultural Celebration Center, is offering that exact question with the return of The Face of Utah Sculpture exhibit now on display in the center’s Celebration Gallery. While he and his staff were responsible for choosing the show’s artists from an open call for entries, the actual work in the show was chosen by the artists themselves. Artists were chosen based on their body of submitted work, but since no particular work was requested, the accepted artists then submitted work of their own choosing, without regard for theme, style, or materials used. Everyone, including Christensen, is surprised each year by the work the gallery receives, and for them, that’s the magic of it. 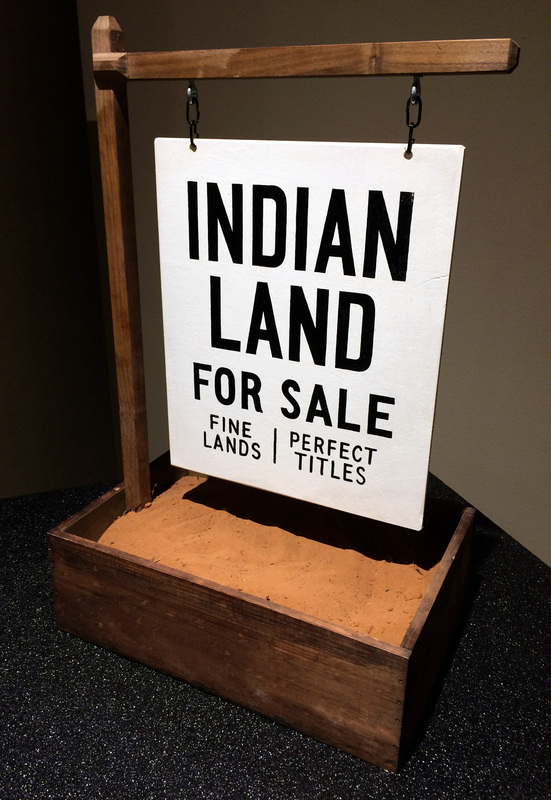 The resulting show then becomes a broad view of what sculpture means in Utah, as well as a curatorial puzzle in which both the gallery and the viewer are offered a kaleidoscope of style and theme. Variety isn’t a strong enough word to describe the work on display. 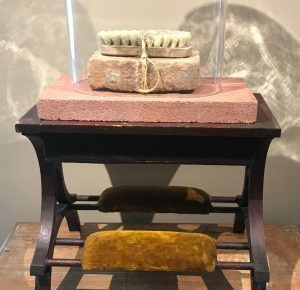 For instance, you’ll find a carefully constructed assemblage by artist Frank McEntire, a desk bearing an analog accounting file system and religious paraphernalia, patiently awaiting pilgrimage near the entrance. 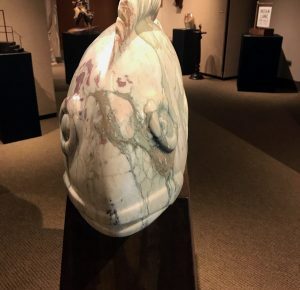 However, swimming toward it is a massive 500-pound marble fish, painstakingly carved by Dahrl Thomson. Visually these pieces are striking together and one could argue that they could be paired successfully under more typical circumstances. 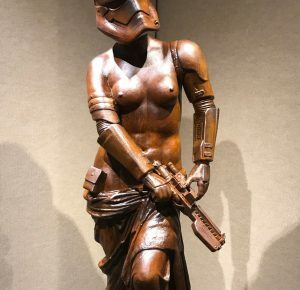 However, the replica Venus de Milo wearing storm trooper gear staring them both down might be cause to question the setup entirely. Taken as a whole, the show can be difficult to absorb as each piece seems to be competing for the audience’s attention with all those around it. The visual dialogue becomes a cacophony of content that at times does a disservice to the artists themselves. On the other hand, the difficult circumstance of the exhibit may contain a hidden opportunity, as viewers are forced to focus completely on an individual work in order to really absorb it. Rather than casually stroll through a room of too-similar pieces, we are encouraged to intently look at one and block all the others out. To their great credit, the artists on display give us ample reason to do so with both skill and content. In fact, some works don’t give us the option. Consider Denae Shanidiin’s clever and simple work, “Not For Sale,” in which ceremonial earth from Bears Ears is impaled with a sign bearing the words “Indian Land For Sale.” Or, the powerful ceramic work of Anne Gregerson and Brian Christensen, each sculpture creating its own fantasy world, one dreamlike, the other nightmarish. 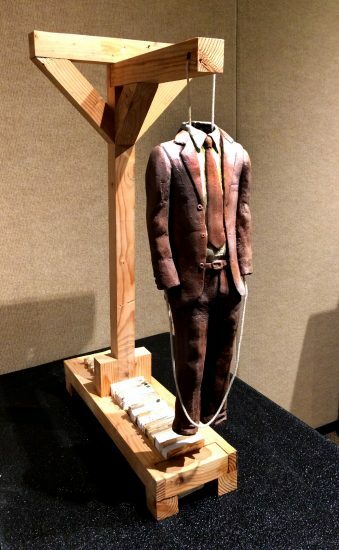 Perhaps the message we’re given by the diverse collection of work is that the variety becomes the theme itself, that Utah artists are far from homogenous, and that given the opportunity, a diverse mixture of voices becomes a symphony of expression. Returning to our original question, what happens when the role of curator is reimagined? It’s a questioned that’s been asked by many and will continue to be asked for some time, but given the continued interest in shows like The Face of Utah Sculpture, we can be sure that there is room for much more exploration within it. 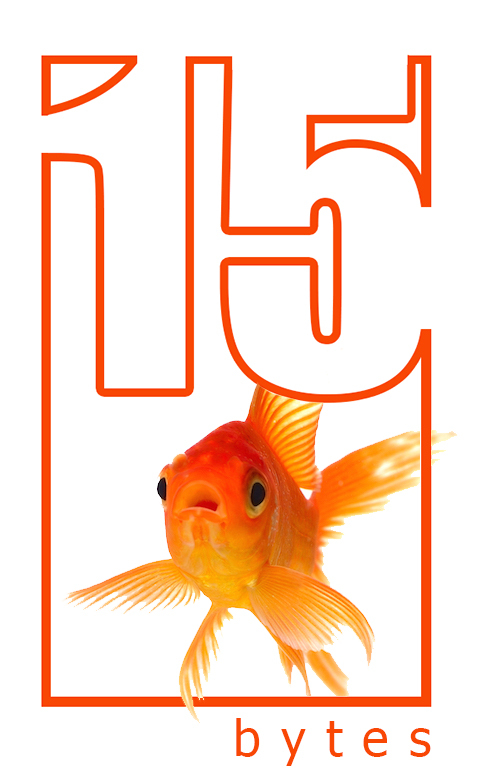 We’d love to know your thoughts about this idea and about the continually changing world of artists and art in Utah. Leave a comment below and help us to keep the dialogue going. David “HABBENINK” Habben is a Salt Lake City based illustrator and artist. He is currently working on an MFA at the University of Utah.